Easy Bunny Ears to complete your easter outfit! From a t-shirt to a bunny bag. No sew. Easy peasy! Make this cute bunny bag with just a few simple steps.
. My kids loved doing these and we might just have an army of snowmen under out tree this year! There will be a few more tutorials before the end of the end. I hope you enjoy them, because I've been having a lot of fun making them. Perhaps you remember THIS post I wrote last summer! My intentions that saturday afternoon was to make a little video of the kids and well the editing process just didn't go as I had planned. Fast forward 6 months later and here I am with my first film, part 1 of many I hope... The Adventures of MissE & MisterM. Adventures of MissE & MisterM from Celina bailey on Vimeo. Please keep in mind that this is not perfect in any way and I am learning along the way, for example my first mistake was shooting vertically, the second is that my editing process of the photos and the film aren't the same and lastly, next time I will be shooting video I will keep filming a little longer past the moment to give myself more leeway when editing. As much as I love capturing just that one moment in a photograph, there is something very special about capturing your kids on film. I am excited to make many more of these and explore different possibilities. Thanks again LADIDA for providing both kids with their awesome tops and being the inspiration for this little video. The past week has been absolutely crazy busy for me- as you might already know I was in New York City for both Playtime and ENK, checking out all the Fall 2013 children's collections. I am still in the process of organising my thoughts and should have a post for you shortly. One of the highlights of my trip was getting to visit the J.Crew Offices and meeting the wonderful designers behind Crewcuts. I really enjoyed working on the Pinterest collaboration and it was nice to finally meet everyone. It was such a pleasure chatting with Laura and finding more about what goes on and how the creative team works, it was all truly inspiring. How fitting, Crewcuts just launched their first film entiled "Crewcuts Quiz", I though I'd share it with you today. You can check out the Video on the J Crew website as well! If you hadn't had a chance to check out the J.Crew pinterest board "The Small Stuff'"- the one I collaborated with, you should! I think you'll really enjoy it! Thank you Raising Cool Kids. Handmade softie trees by Etsy seller Quietude Quilt. Wooden birds by Kristian Vedel for Habitat. Monty the Fox from Etsy store Saracarr. Handmade wood iceberg stacking toy from Etsy store Imagination Kids. 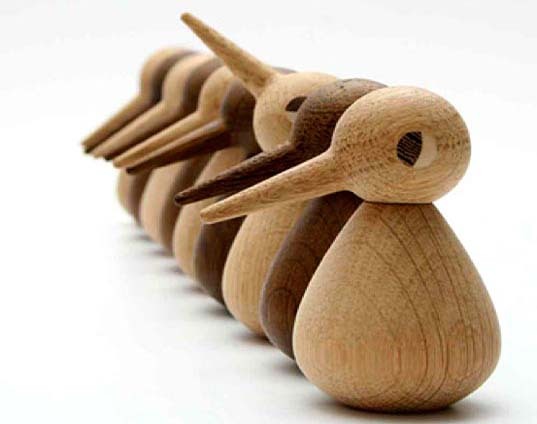 Balancing wood penguins by Voila Toys.